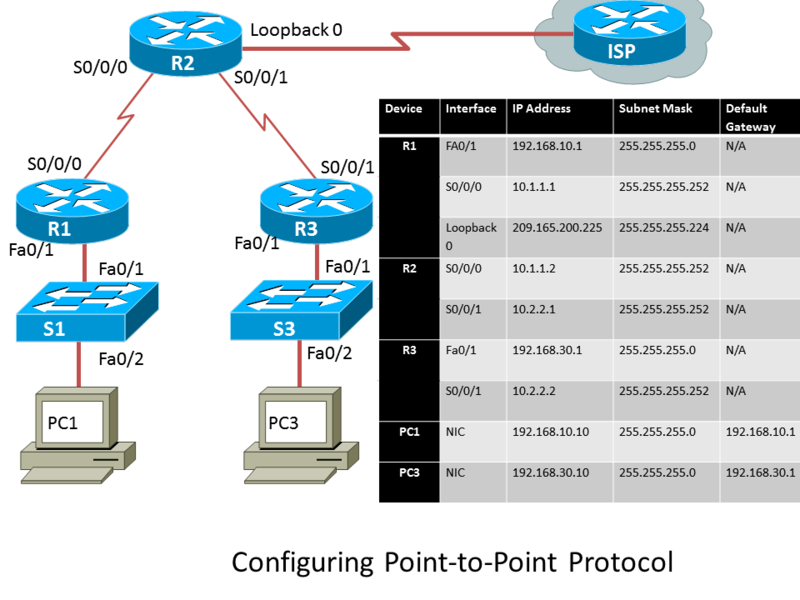 This tutorial will be going over Basic Configuration of PPP (Point-to-Point Protocol). This tutorial includes Basic Configuration tasks on a router, Configuring OSPF routing protocol, and Configuring PPP PAP and CHAP authentication. Let’s get started! We can see in the above diagram we will be using three routers, a loop back connection, two switches (which we will leave them at their default configuration) and two PCs If you are using packet tracer or using real devices than cable the network. The next couple of steps are assuming you already know the material. So you see that all routers have the encapsulation of HDLC, if we were to put PPP on one end of a serial interface say R2’s S0/0/0 interface and leave HDLC on the other end what would happen? If you guessed that the link would go down you are correct. But also OSPF would get rid of that route in the routing table. You have to be careful when configuring PPP especially on a production network. You run the risk of making you network inoperable if you are not careful setting the different encapsulations. This is R2’s output for the encapsulation change from HDLC to PPP, again notice how OSPF is going down because of the different encapsulation. R3 is still running HDLC therefore the link is down. So for this example R1’s username is R1 and the password is knowing. The example from R2’s username is R2 and the password is knowing. Back to R1 we want to go to the interface that R2 is connected to(interface s0/0/0) then we would type ppp authentication pap hit enter (notice the link went down between R1 and R2). Type ppp pap sent-username R2 password knowing This will send the username of R2 and the password of “knowing” to R2. R2 will check the username and password and because they match R2’s username and password PPP will be authenticated. Let’s do the same thing with R2 as we did with R1 but remember to type R1’s username (R1) and password (knowing) on R2’s interface that connects to R1 (serial0/0/0) Also notice that the link between R1 and R2 went back up. Now that R1 and R2 are working with PAP with PPP we can put CHAP between R2 and R3. CHAP stands for (Challenge Handshake Authentication Protocol) because of the challenge CHAP is a stronger authentication than PAP. CHAP also encrypts the password so it is not sent in plain text. Let’s do the same thing for R3 as we did for R2’s serial interface link (0/0/1) The username will be R2 and the password will be “knowing”. (because of the three-way handshake CHAP uses) Also notice the link between R3 and R2 it went back up and OSPF is working again.